The U.S. growth momentum may pause in the fourth quarter, due to some special circumstances. The outlook for early 2015 shows some upside beyond the 2.5 percent pace. And this is despite continued slow economic growth around the world and a rise in the value of the dollar. The biggest disappointment right now is business spending on equipment which is slowing from an average pace of 11 percent over the past two quarters. But if final demand picks up as expected, business investment might also gain some momentum. One key driver of demand is continued improvement in the labor market. Job growth has been solid for the past year and the signal from the latest reading on The Conference Board Employment Trends Index™ (ETI) is that it will continue at least over the very near term. In fact, continued employment gains are likely to lead to better gains in wages in the first half of 2015. Job and income growth may provide some moderately positive momentum for the housing market. Low gasoline prices will also further support household spending. Finally, very low interest rates, at both the short and long end of the yield spectrum help consumers and businesses. The strengthening of domestic growth is intensifying pressures to increase the base interest rate, but speed and trajectory remain important questions. Oil- and gas-producing states—leaders in the early years of the U.S. recovery—no longer predominated. This reflects the energy sector’s slowing expansion, although two states with the strongest shale activity, Texas and North Dakota, remained near the top. Meanwhile, several Sunbelt states hit hard by the housing crisis—Florida, Georgia and Arizona, for instance—are beginning to bounce back. 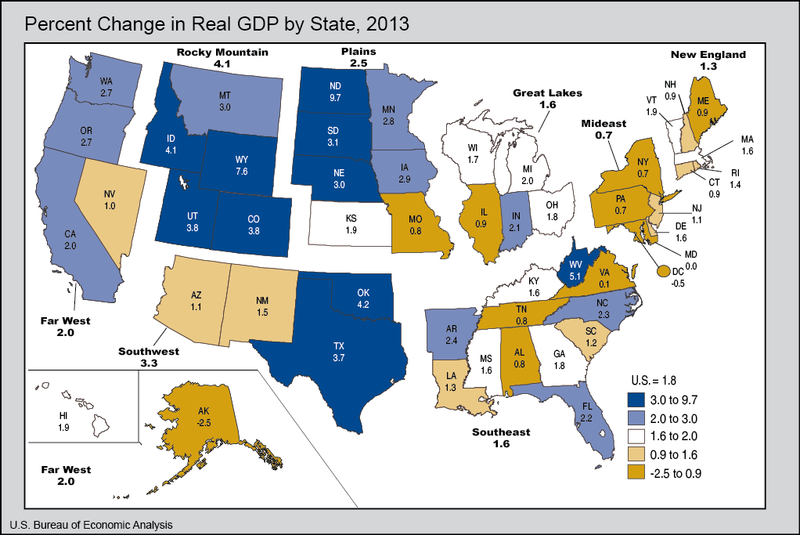 In these states, employment remains significantly below the prerecession peak; in Texas, it is significantly above. Texas is vulnerable, as are other energy rich US states, due to the weakness in the price of oil, however, Texas is also reliant on trade with Mexico for more than half of its exports. The down-turn in Mexican growth due to the weaker oil price, is an additional headwind for the “lone star” state. The point is not that wage growth has been worrisomely high (it hasn’t been) or that we’re in imminent danger of a wage-price spiral (we likely aren’t). Rather, there’s nothing in the behavior of wage inflation over the course of the recovery to suggest that the unemploy­ment rate has been sending misleading signals about our progress toward full employment. A secondary point—a cau­tion, really—is that when trying to draw inferences about labor-market slack from the behavior of wages, it’s important to recognize that wage inflation’s response to slack is both nonlinear and delayed. …Do we keep the accelerator pedal to the floor right up to the point where we reach our destination? Or do we ease up as we near our goal? The answer depends on an assessment of the costs of possibly delaying achievement of our objectives versus the costs of overshoot­ing those objectives. Proponents of a patient approach to removing accom­modation emphasize the risk of having to backtrack on policy, should either real growth or inflation expectations falter. On the other hand, Fed policymakers successfully “tapped the brakes” in the middle of three of our longest economic expansions (in the 1960s, 1980s and 1990s), slowing—but not ending—the unemployment rate’s decline. By com­parison, there are no instances where the Fed has successfully eased the unem­ployment rate upward after having first overshot full employment: When the economy goes into reverse, it has a pro­nounced tendency to lurch backward all the way into recession. Although inflation is currently low, some commentators fear that continued highly accommodative monetary policy may lead to a surge in inflation. However, projections that account for the different policy tools used by the Federal Reserve suggest that inflation will remain low in the near future. Moreover, the relative odds of low inflation outweigh those of high inflation, which is the opposite of historical projections. An important factor continuing to hold down inflation is the persistent effects of the financial crisis. Overall, this Letter suggests that inflation is not expected to surge in the near future. According to this model, the risks to the inflation outlook remain tilted to the downside. The financial crisis disrupted the credit market, leading to lower investment and underutilization of resources in the economy, causing slower growth, which in turn put downward pressure on inflation. My analysis suggests that these effects from the crisis explain a substantial part of the outlook for inflation. Monetary policy has played a stabilizing role in the recent past, preventing inflation from falling further below its 2% target. Moreover, the analysis suggests that monetary policy is not contributing to the risk of inflation being above the median projection in the near future. The risk of high inflation in the next one to two years remains very low by historical standards. The analysis suggests that the factors keeping inflation low are expected to be transitory. However, differences between projected and realized inflation in the recent past suggest that those factors may in reality be more persistent than implied by the model. According to a recent poll from the Washington Post Miller Center, American workers’ anxiety over jobs is at a four-decade record high. Meanwhile, the hydrocarbon sector’s contributions to America’s job picture and the role of its small businesses in keeping the nation out of a long recession are not widely recognized. 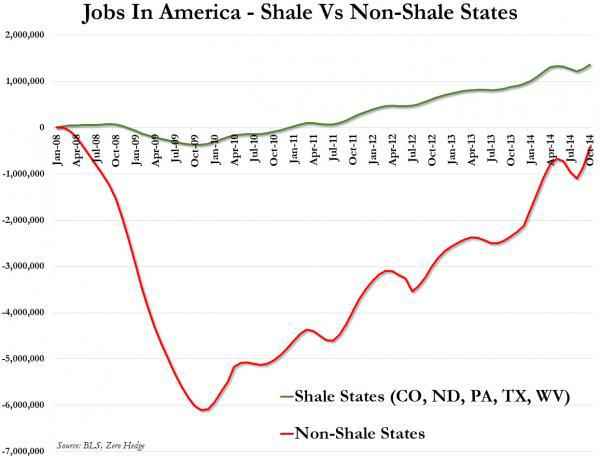 Another recent survey found that only 16 percent of people know that an oil & gas boom has increased U.S. energy production—collaterally creating jobs both directly and indirectly. In a new report evaluating five “game changers” for growth, the McKinsey Global Institute concluded that the hydrocarbon sector has the greatest potential for increasing the U.S. GDP and adding jobs—with an impact twice as great as big data by 2020. McKinsey forecasts that the expanding shale production can add nearly $700 billion to the GDP and almost 2 million jobs over the next six years. Other analysts looking out over 15 years see 3–4 million more jobs that could come from accelerating domestic hydrocarbon energy production. Even these forecasts underestimate what would be possible in a political environment that embraced growth-centric policies. In November 2013, President Obama delivered a speech in Ohio on jobs and the benefits from greater domestic energy production. The president highlighted the role of improved energy efficiency and alternative fuels. But as the facts show, no part of the U.S. economy has had as dramatic an impact on short-term job creation as the small businesses at the core of the American oil & gas boom. And much more can be done. A recent report by Deutsche Bank – Sinking Oil May Push Energy Sector to the Brink – estimated that of $2.8trln annual US private investment, $1.6trln is spent on equipment and software and $700bln on non-residential construction. Of the equipment and software sector, 25-30% is investment in industrial equipment for energy, utilities and agriculture. Non-residential construction is 30% energy related. With oil below $60/barrel much of that private investment will be postponed or cancelled. That could amount to a reduction in private investment of $500bln in 2015. This process is already underway; according to Reuters, new oil permits plummeted 40% in November. 2015 will see a correction in this trend, not just because investment stalls, but also as a result of defaults in the high-yield bond market. Deutsche Bank strategists Oleg Melentyev and Daniel Sorid estimate that, with oil at $60/barrel, the default rate on B and CCC rated bonds could be as high as 30%. Whilst this is bad news for investors it is also bad news for banks which have thrived on the securitisation of these bonds. The yield expansion seen in the chart above suggests there is a liquidity short-fall at work here – perhaps the Fed will intervene. As a result of the growth in the US energy sector, banks have become more actively involved in the energy markets. Here the scale of their derivative exposure may become a systemic risk to the financial sector. When oil was trading at its recent highs back in July the total open speculative futures contracts stood at 4mln: that is four times the number seen back in 2010. The banks will also be exposed to the derivatives market as a result of the loans they have made to commodity trading companies – some of whom may struggle to meet margin calls. Bad loan provisions will reduce the credit available to the rest of the economy. This will dampen growth prospects even as lower energy prices help the consumer. On the 15th October, at the depths of the stock market correction, 2yr Notes yielded 0.308% whilst 10yr Notes yielded 2.07%. Since then the 2yr/10yr curve has flattened by 25bp. I believe this price move, in the short end of the market, is being driven by expectations that the Fed will move to “normalise” policy rates in the next 12 months. Governor Yellen’s change of emphasis in this weeks FOMC statement – from “considerable time” to “patient” – has been perceived by market pundits as evidence of more imminent rate increases. An additional factor driving short term interest rates higher is the tightening of credit conditions connected to the falling oil price. Longer maturity Treasuries, meanwhile, are witnessing a slight “flight to quality” as fixed income portfolio managers switch out of High Yield into US government securities even at slightly negative real yields. According to an article in the Financial Times – Fall in oil price threatens high-yield bonds – 7th December $40bln was withdrawn from US High Yield mutual fund market between May and October. I expect this process to gather pace and breed contagion with other markets where the “carry trade” has been bolstered by leveraged investment flows. The Federal Reserve Bank of New York’s December 2014 Business Leaders Survey indicates that activity in the region’s service sector expanded modestly. The survey’s headline business activity index fell ten points to 7.8, indicating a slower pace of growth than in November. The business climate index inched down two points to -7.8, suggesting that on balance, respondents continued to view the business climate as worse than normal. The employment index climbed three points to 16.3, pointing to solid gains in employment, while the wages index drifted down five points to 25.6. After declining sharply last month, the prices paid index climbed four points to 42.2, indicating a slight pickup in the pace of input price increases, while the prices received index fell eight points to its lowest level in two years, at 5.4, pointing to a slowing of selling price increases. The current capital spending index declined ten points to 10.1, while the index for future capital spending rose six points to 25.0. Indexes for the six-month outlook for business activity and employment fell noticeably from last month, suggesting that firms were less optimistic about future conditions. CEOs have increased the proportion of cash flow allocated to stock buybacks to more than 30 percent, almost double where it was in 2002, data from Barclays show. During the same period, the portion used for capital spending has fallen to about 40 percent from more than 50 percent. The reluctance to raise capital investment has left companies with the oldest plants and equipment in almost 60 years. The average age of fixed assets reached 22 years in 2013, the highest level since 1956, according to annual data compiled by the Commerce Department. I am cynical about share buybacks. If they are running at twice the average pace this suggests, firstly, that the “C suite” are more interested in their share options than their shareholders and, secondly, that they are still uncomfortable making capital expenditure decisions due to an utter lack of imagination and/or uncertainty about the political and economic outlook. Either way, this behaviour is not a positive long-term phenomenon. I hope it is mainly a response to the unorthodox policies of the Fed: and that there will be a resurgence in investment spending once interest rates normalise. This might also arrive sooner than expected due to a collapse in inflation rather than a rise in official rates. The US economy will benefit from lower energy prices in the long term but the rebalancing away from the energy sector is likely to take time, during which the stock market will have difficulty moving higher. For the first time since 2008, the risks are on the downside as we head into 2015. Sector rotation is certainly going to feature prominently next year. Business leaders continue to reflect optimism about the coming months, with 91.2 percent of survey respondents saying they are either somewhat or very positive about their own company’s outlook. Moreover, manufacturers predict growth of 4.5 percent in sales and 2.1 percent in employment over the next 12 months, with both experiencing the strongest pace in at least two years. These findings were largely consistent with other indicators released last week. Most notably, the U.S. economy added 321,000 nonfarm payroll employees on net in November. This was well above the consensus estimate, and it was the fastest monthly pace since April 2011. Hiring in the manufacturing sector was also strong, with 28,000 new workers during the month. Since January, manufacturers have hired almost 15,000 workers on average each month, or 740,000 total since the end of 2009. In other news, manufacturing construction spending was also up sharply, increasing 3.4 percent in October and a whopping 23.0 percent year-over-year. These reports suggest that accelerating growth in demand and output is beginning to translate into healthier employment and construction figures, with businesses stepping up investments, perhaps as a sign of confidence. This should bode well for manufacturing employment as we move into 2015. In particular, the Institute for Supply Management’s (ISM) manufacturing Purchasing Managers’ Index (PMI) remains strong, despite edging marginally lower in November. For instance, the production index has now been 60 or higher, which indicates robust expansionary levels, for seven straight months. Similarly, the new orders index has been 60 or higher for five consecutive months, and the export measure also noted some improvements for the month. Speaking of exports, the U.S. trade deficit changed little in October, edging marginally lower from the month before. Still, growth in goods exports was somewhat better than the headline figure suggested, with the value of petroleum exports declining on lower crude oil costs. The good news is that year-to-date manufactured goods exports have increased to each of our top-five trading partners so far this year. …growth in manufactured goods exports remains sluggish through the first 11 months of 2014, up just 1.1 percent relative to the same time frame in 2013. Not surprisingly, challenges abroad continue to dampen our ability to grow international sales. New factory orders have declined for the third straight month, a disappointing figure particularly given the strength seen in other measures. In addition, the NAM/IndustryWeek survey noted that the expected pace of exports decelerated once again, mirroring the slow growth in manufactured goods exports noted above. Industrial production increased 1.3 percent in November after edging up in October; output is now reported to have risen at a faster pace over the period from June through October than previously published. In November, manufacturing output increased 1.1 percent, with widespread gains among industries. The rise in factory output was well above its average monthly pace of 0.3 percent over the previous five months and was its largest gain since February. In November, the output of utilities jumped 5.1 percent, as weather that was colder than usual for the month boosted demand for heating. The index for mining decreased 0.1 percent. At 106.7 percent of its 2007 average, total industrial production in November was 5.2 percent above its year-earlier level. Capacity utilization for the industrial sector increased 0.8 percentage point in November to 80.1 percent, a rate equal to its long-run (1972–2013) average. This paints a positive picture but, with Capacity Utilisation only returning to its long-run trend rate, I remain concerned that the weakness of the energy sector will undermine the, still nascent, recovery in the broader economy in the near-term. 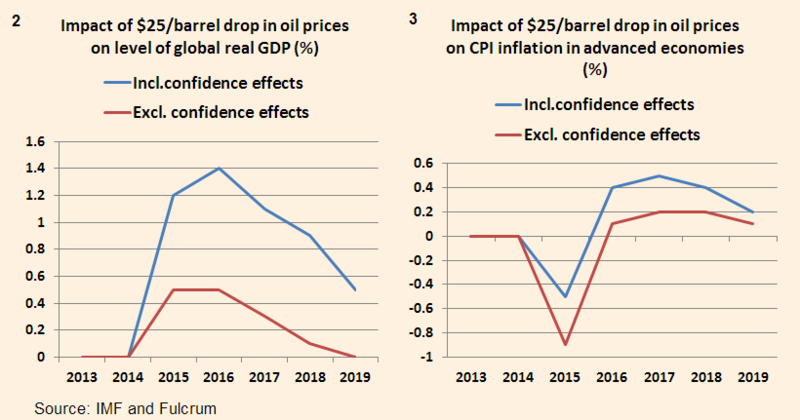 The decline in the oil price, if it holds, should have a long-term benign effect on US growth and inflation. In the shorter term, however, the rebalancing of the economy away from the energy sector may take its toll, not just on the energy sector, but also on financial services – both the banks, which have lent the energy companies money, and the investors, who have purchased energy related debt. This will breed contagion with other speculative investment markets – lower quality bonds, small cap growth stocks and leveraged derivative investments of many colours. A decline in the S&P 500 will impact other developed markets, especially those reliant on the US for exports. 2015 will be a transitional year if oil prices remain depressed at current levels, yet the longer term benefit of lower energy prices will feed through to a recovery in 2016/2017. A crisis could ensue next year, but, with China, Japan and the EU continuing to provide quantitative and qualitative support, I do not believe the world’s “saviour” central banks are “pushing on a string” just yet. Inflation is likely to fall, global growth will be higher, but US stocks will, at best, mark time in 2015. In bond markets, credit will generally be re-priced to reflect the increased risk of corporate defaults due to mal-investment in the energy sector. Carry trades will be unwound, favouring government bonds to some degree. Recently heightened expectations of higher short term interest rates will recede. This should be supportive for the Real-Estate market. With a presidential election due in 2016 both the Democrats and the Republicans will be concocting policies to support house prices, jobs, average wages and the value of 401k’s. After three years of deliberation, the introduction of watered down QRM – Qualified Residential Mortgage – rules in October suggests this process is already in train. Many investors have been waiting to enter the stock market, fearing that the end of QE would herald a substantial correction. 2015 might provide the opportunity but by 2016 I believe this window will have closed. Aside from the steady strengthening of the US$ there are a number of factors which have conspired to drive oil prices lower. Firstly there has, and will continue to be, additional supply emanating from the US where improved energy technology has produced significant increase in production over the last five years –from 1.8bln barrels in 2008 to 2.3bln barrels in 2013. In May 2014 it hit a 25 year high of 8.4mln barrels and the Energy Information Administration (EIA) forecast 2015 production will hit the highest level since 1972. The economic impact of cheaper US energy underpins a manufacturing renaissance which is slowly gathering momentum across America. The world’s two largest emitters of carbon dioxide together pledged deep reductions – well in advance of the pressure they will face in the upcoming UN Climate Change negotiations that begin in Lima later this month, and which are scheduled to conclude a year from now in Paris. They also did so at a level deeper than many had expected. While both countries have already begun efforts to cut emissions, the timing of the announcement and the depth of the reductions went beyond what many diplomats, businesses and environmental groups anticipated. … Internationally, both countries have a range of other issues to address – including working with the poorest nations which lack the resources to make similarly dramatic cuts, but who are deeply affected by a warmer, wetter world. Still, even with all those obstacles ahead, today’s agreement is the beginning of a great leap forward for climate protection. Also hanging over the market is the prospect of Iranian production increases as international sanctions are reduced. Between 2011 and 2013 Iranian oil exports declined from 3mln bpd to less than 1mln bpd. This year they have rebounded strongly, averaging more than 1mbpd. Iranian production has been running at around 3 mbpd but the National Iranian Oil Company expects an increase to 4.3 mbpd next year – though several commentators are doubtful of Iran’s ability to achieve this increase in output. For more detail on the Iranian situation this article – Al Monitor – Iran takes steps to reduce economic risk of falling oil prices may be of interest. There are some demand factors which may also undermine prices. Chinese growth has been slowing but, more importantly, the Chinese administration has adopted a policy of re-balancing away from production towards domestic consumption. In theory this process should reduce China’s energy demand; off-set, to some degree, by increased export demand from other emerging market countries as they seek to supply China’s consumption needs. I believe lower energy prices will help Chinese exporters to increase margins or export volumes – or both. Oil’s rout gained momentum in October and extended into November, with Brent at a four-year low below $80/bbl. 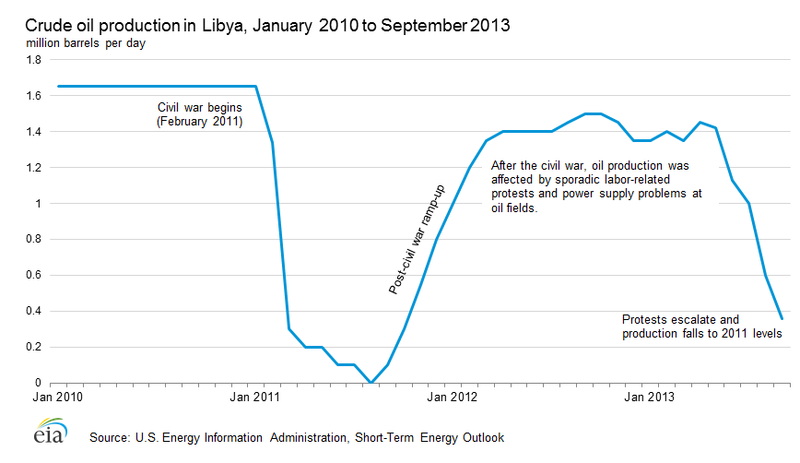 A strong US dollar and rising US light tight oil output outweighed the impact of a Libyan supply disruption. ICE Brent was last trading at $78.50/bbl – down 30% from a June peak. NYMEX WTI was at $75.40/bbl. Global oil supply inched up by 35 kb/d in October to 94.2 mb/d. Compared with one year ago, total supply was 2.7 mb/d higher as higher OPEC production added to non-OPEC supply growth of 1.8 mb/d. 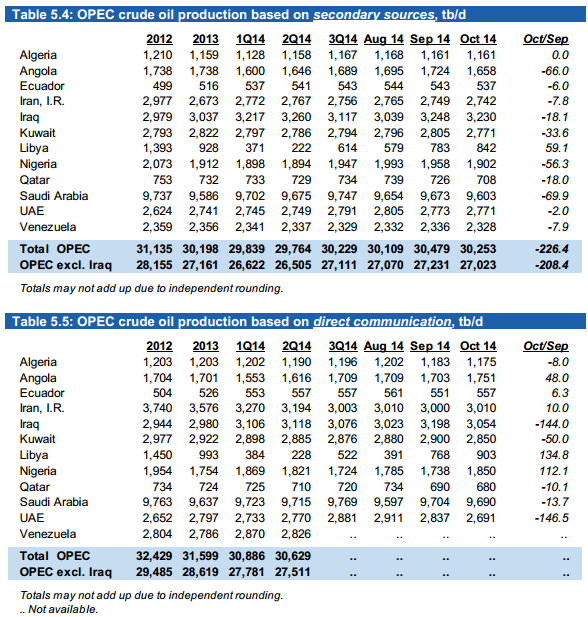 Non-OPEC production growth is forecast to ease to 1.3 mb/d for 2015 from this year’s 1.8 mb/d high. OPEC output eased by 150 kb/d in October to 30.60 mb/d, remaining well above the group’s official 30 mb/d supply target for a sixth month running. The group’s oil ministers meet on 27 November against the backdrop of a 30% price decline since they last gathered in June. Global oil demand estimates for 2014 and 2015 are unchanged since last month’sReport, at 92.4 mb/d and 93.6 mb/d, respectively. Projected growth will increase from a five-year annual low of 680 kb/d in 2014 to an estimated 1.1 mb/d next year as the macroeconomic backdrop is expected to improve. OECD industry oil stocks built counter-seasonally by 12.6 mb in September. Their deficit versus average levels, after ballooning earlier this year, fell to its narrowest since April 2013. Preliminary data show that despite a 4.2 mb draw, stocks swung into a surplus to average levels in October for the first time since March 2013. Global refinery crude demand hit a seasonal low in October amid peak plant maintenance and seasonally weak product demand. The 4Q14 throughput estimate is largely unchanged since last month’s Report, at 77.5 mb/d, as robust Russian and Chinese throughputs offset a steeper-than-expected drop in US runs in October. From a technical perspective the breakout from the 2011 range to the downside suggests support around $66, $62, $58, with a final capitulation target of $46. There are, however, reasons to be more optimistic about the prospects for oil, even near-term. Whilst oil prices may trend somewhat lower the term structure of the TWI futures market has recently returned from several years of backwardation to contango – Brent Crude has been in contango for some while. This suggests that lower prices are beginning to reduce US domestic over-supply as smaller US operators cease to be able to produce oil profitably. Below $65 the EIA forecast for 2015 will probably need to be revised lower. Prices are likely to be better underpinned at their current levels. Another encouraging factor is US domestic demand from refiners. 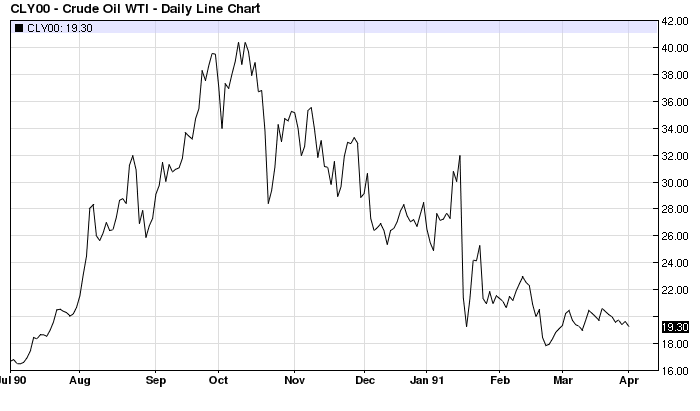 US Crack spreads – the price spread between crude oil and its products – has started to widen in recent weeks. Oil demand should increase in response to higher product margins. The cracking margins have risen most dramatically for Gasoline but Heating Oil margins have also improved and may catch up if predictions of an exceptionally cold winter in the Northern hemisphere prove to be correct. NOAA – Winter Outlook from last month is reasonably sanguine – warm in the West and Alaska, cold in South and Rockies – but substantial snowfall in Siberia (the largest in October since 1967) is cause for caution. Virtually all businesses will benefit from lower transportation costs by expanding their profit margins or passing the benefit to consumers at lower prices. The lower income groups, who spend a higher proportion of their incomes on transport, will see their disposable incomes rise, benefiting retailers who serve their needs and thereby increasing demand in the economy. Food prices are also likely to fall, as food production, processing and sales distribution are energy intensive activities, thereby benefiting lower income groups further. Increased consumption will stimulate aggregate demand, creating investment opportunities and economic growth. Governments in the west may also have the opportunity to increase fuel taxes to cover the real cost of the negative externalities of carbon emissions, or raise revenue to improve public transportation systems. Furthermore, governments in the Middle East and Asia will reduce spending on their fuel subsidies and may take the opportunity to improve the workings of market forces, which the IMF and Western powers have been seeking for them to do. The fall in inflation will be of greater concern to the ECB than the other major central banks. The BoJ has already acted aggressively in response to the economic slowdown in Japan, the Abe government has deferred a scheduled tax increase and announced an early election. The Federal Reserve, having completed its tapering of QE, will be focussed on wage growth. As central bank to the world’s second largest and rising oil producer, the Fed will be concerned about the drag on growth from a slowdown in the energy and utility sectors; market expectations of interest rate increases will be deferred once again. If the ECB act aggressively to head off the chimera of deflation this may be enough to improve global confidence – I believe this makes the blue line prediction more likely. 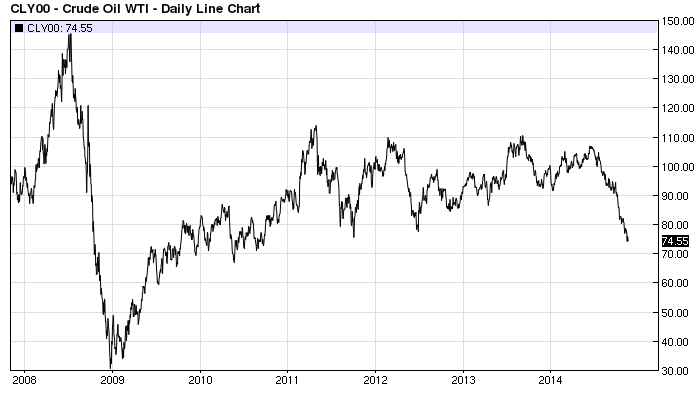 If WTI should plummet towards $60, the improvement in economic growth should be even greater. As recently as last month the IMF – World Economic Outlook – forecast for Oil prices was $102.76 for 2014 and $99.36 for 2015. They continue to cling to their forecasts based on expectation of increased geo-political tensions. Given that their 2015 forecast is around 30% above current levels if they are mistaken and the oil price remains subdued their global growth forecast could be around 0.6% too low. A 10% change in the oil price is associated with around a 0.2% change in global GDP, says Tom Helbling of the IMF. A price fall normally boosts GDP by shifting resources from producers to consumers, who are more likely to spend their gains than wealthy sheikhdoms. If increased supply is the driving force, the effect is likely to be bigger—as in America, where shale gas drove prices down relative to Europe and, says the IMF, boosted manufactured exports by 6% compared with the rest of the world. But if it reflects weak demand, consumers may save the windfall. Energy is the main input into fertilisers, and in many countries farmers use huge amounts of electricity to pump water from aquifers far below, or depleted rivers far away. A dollar of farm output takes four or five times as much energy to produce as a dollar of manufactured goods, says John Baffes of the World Bank. Farmers benefit from cheaper oil. And since most of the world’s farmers are poor, cheaper oil is, on balance, good for poor countries. Take India, home to about a third of the world’s population living on under $1.25 a day. Cheaper oil is a threefold boon. First, as in China, imports become cheaper relative to exports. Oil accounts for about a third of India’s imports, but its exports are diverse (everything from food to computing services), so they are not seeing across-the-board price declines. 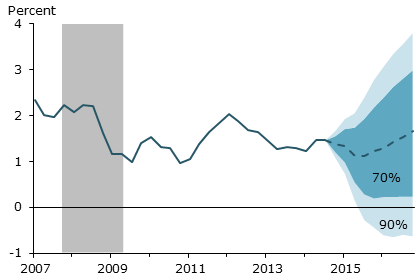 Second, cheaper energy moderates inflation, which has already fallen from over 10% in early 2013 to 6.5%, bringing it within the central bank’s informal target range. This should lead to lower interest rates, boosting investment. Third, cheaper oil cuts India’s budget deficit, now 4.5% of GDP, by reducing fuel and fertiliser subsidies. These are huge: along with food subsidies, the total is 2.5 trillion rupees ($41 billion) in the year ending March 2015—14% of public spending and 2.5% of GDP. The government controls the price of diesel and compensates sellers for their losses. But, for the first time in years, sellers are making a profit. As in China, cheaper oil should reduce the pain of cutting subsidies—and on October 19th Narendra Modi, India’s prime minister, said he would finally end diesel subsidies, free diesel prices and raise natural-gas prices. The price move has also prompted a response from the researchers at the Dallas Fed – Oil Prices Fall Despite Global Uncertainty – whilst their concern is broadly domestic they note that it is Non-OECD demand which is driving the increase in oil demand. The largest beneficiaries of lower oil prices will be oil importing emerging market countries: China, India and, to the extent that they are still considered an emerging economy, South Korea. Other candidates include Singapore, Taiwan, Poland, Greece, Indonesia, South Africa, Brazil and Turkey. The fall in oil prices has been mirrored, inversely, by the rise of the US$. This trend is already well established but I expect it to continue. This is not so much a reflection of the strength of the US economy as the moribund nature of growth expectations in the EU and Japan. Lower inflation expectations, combined with central bank inflation targets, should ensure a delay to interest rate tightening even in response to a resurgence of wage growth. Bond prices will continue to be underpinned. At any sign of a slowing of economic growth, yield curves will flatten further. 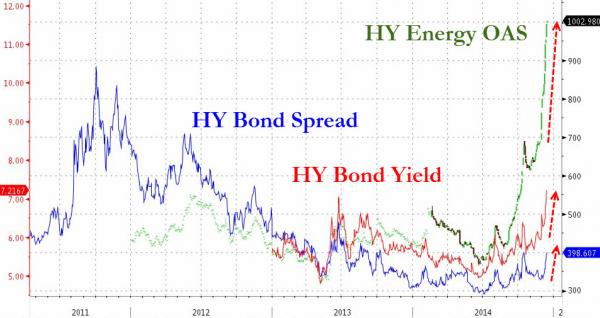 Convergence of EZ bond yields will continue. Expectation of “Lower for Longer” interest rates and cheaper oil is supportive for stock markets in general although there will be sector specific winners and losers. Geographically, lower oil prices will favour those economies most reliant on oil imports, especially if their exchange rate is pegged to the US$. Given the under-performance of many emerging market equities over the last few years I believe this offers the best investment opportunity going forward into 2015. Those countries with floating exchange rates such as India have already benefitted from currency devaluation of 2013; however, there is still potential upside for equities, even after the strong performance of 2014. The SENSEX Index (BSE) started the year around 21,000 and is currently making new highs at 28,000, but during the last three months it has tended to track the performance of the S&P 500 Index – despite the fall in oil prices. I anticipate a general re-rating of emerging market equities next year. 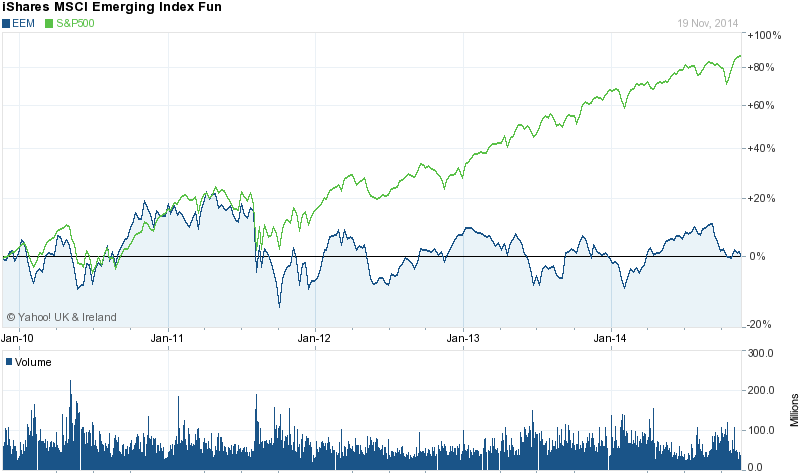 During 2013 developed market equities were the top performing major asset class. The US and UK had justification for rising since the effects of quantitative easing appear to have stimulated some economic activity. Europe, however, has less reason for strength since ECB policies have been less accommodative. The performance of the German mid-cap index aside, European equity market performance in 2013 was largely due to receding fears of the break-up of European currency union. This has been a major contributor to the decline in peripheral bond yields as the chart below shows. When German Finance Minister Wolfgang Schäuble, a trained lawyer, announced an agreement on Wednesday night in Brussels on the long negotiated EU banking union, observers might have been left thinking that he is precisely this type of lawyer. On paper, Schäuble and his negotiators are right about very many points. They succeeded in ensuring that in 2016, the Single Resolution Mechanism will go into effect alongside the European Union banking supervisory authority. The provision will mean that failing banks inside the euro zone can be liquidated in the future without requiring German taxpayers to cover the costs of mountains of debt built up by Italian or Spanish institutes. They also backed the European Commission, which wanted to become the top decision-maker when it comes to liquidating banks. The Commission will now be allowed to make formal decisions, but only in close coordination with national ministers from the member states. But it goes even farther. Negotiators from Berlin have also created an intergovernmental treaty, to be negotiated by the start of 2014, that they believe will protect Germany from any challenges at its Constitutional Court that might arise out of the banking union. They also established a very strict “liability cascade” that will require bank shareholders, bond holders and depositors with assets of over €100,000 ($137,000) to cover the costs of a bank’s liquidation before any other aid kicks in. The banks are also required to pay around €55 billion into an emergency fund over the next 10 years. Until that fund has been filled, in addition to national safeguards, the permanent euro bailout fund, the European Stability Mechanism, will also be available for aid. However, any funds would have to be borrowed by a national government on behalf of banks, and that country would also be liable for the loan. This provision is expected to be in place at least until 2026. It’s underfunded – The Single Resolution Mechanism, at Euro 55bln by 2026, is a drop in the ocean. It will probably take at least five years to establish joint European liability. • Estimates of the recapitalisation needs of the euro-area banking system vary between €50 and €600 billion. The range shows the considerable uncertainty about the quality of banks’ balance sheets and about the parameters of the forthcoming European Central Bank stress tests, including the treatment of sovereign debt and systemic risk. Uncertainty also prevails about the rules and discretion that will apply to bank recapitalisation, bank restructuring and bank resolution in 2014 and beyond. • The ECB should communicate the relevant parameters of its exercise early and in detail to give time to the private sector to find solutions. The ECB should establish itself as a tough supervisor and force non-viable banks into restructuring. This could lead to short-term financial volatility, but it should be weighed against the cost of a durably weak banking system and the credibility risk to the ECB. The ECB may need to provide large amounts of liquidity to the financial system. • Governments should support the ECB, accept cross-border bank mergers and substantial creditor involvement under clear bail-in rules and should be prepared to recapitalise banks. Governments should agree on the eventual creation of a single resolution mechanism with efficient and fast decision-making procedures, and which can exercise discretion where necessary. A resolution fund, even when fully built-up, needs to have a common fiscal backstop to be credible. The initial Asset Quality Review (AQR) of European Banks carried out in 2011 by the European Banking Authority proved to be a political embarrassment since almost every bank was found to be in relatively rude financial health: shortly before bailouts were required. The test, which was blessed by last month’s ill-fated European summit, had two problems. First, it wasn’t stringent enough: the European Banking Authority concluded that Europe’s lenders needed an additional 106 billion euros, when the International Monetary Fund thought about twice as much was needed. The test has done little to restore confidence in the blighted sector. Banks are still unable to issue long-term unsecured debt, and have been increasingly thrown back on short-term support from the European Central Bank. Second, the test encouraged deleveraging by expressing the capital requirement as a ratio and giving lenders eight months to get there. Given depressed share prices, many banks are anxious to avoid issuing equity. Instead they are trying to boost capital ratios by shrinking their balance sheets. This will almost certainly have the unfortunate side-effect of further suffocating the European economy, which is already on the edge of recession. The current iteration of the AQR will, undoubtedly, have more “teeth” but these are shark infested waters where an ECB “health warning” might precipitate an ugly banking crisis. Europe’s banking union project has had many doubters since it started to be widely discussed in the spring of 2012. What is not in doubt, however, is its transformative nature. In June 2012, EU leaders chose—in a galloping hurry, as usual—to move towards the centralization of bank supervision across euro area countries, with this authority entrusted to the European Central Bank (ECB). The consequences have only gradually become apparent to most and represent both an opportunity and a risk. The opportunity is to reestablish trust in European banks, reboot the pan-European interbank market, end dysfunctional credit allocation, and start reversing the vicious circle between bank and sovereign credit. In an optimistic scenario, the ECB’s 12-month process of “comprehensive assessment,” including an asset quality review (AQR) and stress tests of about 130 credit institutions covering 85 percent of the euro area’s banking assets, will trigger the triage, recapitalization, and restructuring that history suggests is a prerequisite for systemic crisis resolution. The risk is that, if the assessment fails to be consistent and rigorous, the ECB may find its reputation so damaged that the credibility of its monetary policy—and the perception of Europe’s ability to get anything done—could be affected. After all, this exercise is unprecedented in scale and scope, which means the ECB has little prior experience. At the same time, the political fallout is potentially poisonous to most of the states concerned. Thus, much is at stake in the balance sheet review, and the scene is set for an escalating confrontation between the ECB and member states in the months ahead. The ECB has pointedly made clear that it will form an independent judgment on the capital strength of the banks examined, without necessarily following the views of national supervisors. A successful AQR and establishment of the Single Supervisory Mechanism (SSM)—EU jargon for the handover of supervisory authority to the ECB—would have structural consequences. Europe’s national and local governments often use their leverage over the publicly-regulated banking industry for industrial policy purposes or to facilitate their own financing, a dynamic known to economists as financial repression. • Bank supervisors should provide publicly accessible, timely and consistent data on the banks under their jurisdiction. Such transparency increases democratic accountability and leads to greater market efficiency. • There is greater supervisory transparency in the United States compared to the member states of the European Union. The US supervisors publish data quarterly and update fairly detailed information on bank balance sheets within a week. By contrast, based on an attempt to locate similar data in every EU country, in only 11 member states is this data at least partially available from supervisors, and in no member state is the level of transparency as high as in the US. • Current and planned European Union requirements on bank transparency are either insufficient or could be easily sidestepped by supervisors. A banking union in Europe needs to include requirements for greater supervisory transparency. Finding agreement on an EU legal change that requires the ECB and member-state supervisors to open their books to greater scrutiny will surely be a difficult task given the current diversity of practices and interests – eg banks, national supervisors – that benefit from this diversity. But greater supervisory transparency will facilitate more efficient distribution of capital and increase market discipline. It will increase the legitimacy of actions that the regulator takes against banks. The European Union receives justified flak that there is a great distance between European citizens and the institutions that make decisions on their behalf. There is real suspicion of the financial sector and distrust that public money goes only to help out political friends. Transparency in terms of the data the supervisors themselves use to make decisions would allow the public, and more realistically the various interest groups one finds in civil society, to judge whether regulators did choose actions consistent with protecting the public interest. Such ‘fire alarms’ therefore represent one small step towards addressing the democratic deficit that most citizens think exists in Europe. If such transparency is not possible, for purposes of increasing ‘output legitimacy’ more work should be done to strengthen the role of parliaments. For the European Parliament, the autumn 2013 interinstitutional agreement with the European Central Bank represents a good start. Under all current proposals, national regulators will continue to play an important role especially for any bank resolution. As discussed earlier, the German Bundestag gains the ability in 2014 to investigate specific banks as part of the national implementation of Basel III. Such parliamentary powers should become standard in all European Union member states. Moreover, such a procedure should be not only a theoretical power, but also one that is used. No major EU elections are scheduled in 2014. In Italy, a new electoral law is unlikely to be agreed upon before it takes over the rotating EU presidency in the second half of 2014. By tradition, countries in that position refrain from holding national elections. Rather, European Parliament elections in May will be the political highlight of 2014. As discussed earlier, there is a risk that angry voters will turn out and elect some colorful non-mainstream members to that body. Still, there seems little risk that the European Parliament will become a “Weimar Parliament” with a majority of anti-EU members. Instead the established European parties seem likely to prevail with a smaller majority, ensuring that Europe remains governable. With their increased representation, the question of what the anti-EU parties want (aside from their daily parliamentary allowances) will arise. Much has been written about the alliance between Marine Le Pen, leader of the French National Front, and the leader of the Dutch Freedom Party Geert Wilders. But theirs is little more than a photo-op coalition, posing limited political risks. There are inherent limitations on the ability of nationalist parties to collaborate across borders. Economically, the biggest event in 2014 will be the rollout of the ECB’s asset quality review (AQR) and stress tests of the euro area banking system, representing the opportunity to finally restore the soundness of Europe’s bank balance sheet. Failure to carry out a convincing review will threaten the region with Japanese-style prolonged stagnation and undermine the credibility of the ECB. The AQR/stress test is more important than the hotly debated single resolution mechanism (SRM) designed to close down or consolidate failing banks, finally agreed by the EU finance ministers in late December [pdf]. Only a successful AQR/stress test can avert the continuing fragmentation of credit markets and reduce the high interest spreads between the core and periphery. Assuming that the SRM can fix financial fragmentation is erroneous, and much of the related criticism of the complex SRM compromise is misplaced. Even an optimally designed SRM would not make euro area banks suddenly lend to each other again. A more pertinent question is whether the SRM compromise makes it more or less likely that the AQR succeeds in 2014. For sure the envisioned SRM is far from perfect. It has an excessively complex structure, including a 10-year phase-in, and a multistage resolution process involving a resolution board, the European Commission, and the EU finance ministers in the ECOFIN (finance ministers’) Council. Parts of it are grounded in EU law and parts are to be embodied by a new intergovernmental treaty. Hopefully some of these kinks will be corrected in the ongoing final reconciliation negotiations on the SRM between the member states and the European Parliament. But writing off the SRM as unworkable just because it is complex is a mistake. The European Union of 28 member states works every day, despite breathtaking complexity. Moreover, in emergencies the European bureaucracy can be circumvented and a decision forced through in 24 hours. The European political landscape may become more polarised in 2014 with right wing parties gaining ground in the European parliament. … There are big differences between the Tea Party and the European insurgents. Whereas the Tea Party’s factions operate within one of America’s mainstream parties, and have roots in a venerable tradition of small-government conservatism, their counterparts in Europe are small, rebellious outfits, some from the far right. The Europeans are even more diverse than the Americans. Norway’s Progress Party is a world away from Hungary’s thuggish Jobbik. Nigel Farage and the saloon-bar bores of the United Kingdom Independence Party (UKIP) look askance at Marine Le Pen and her Front National (FN) across the Channel. But there are common threads linking the European insurgents and the Tea Party. They are angry people, harking back to simpler times. They worry about immigration. They spring from the squeezed middle—people who feel that the elite at the top and the scroungers at the bottom are prospering at the expense of ordinary working people. And they believe the centre of power—Washington or Brussels—is bulging with bureaucrats hatching schemes to run people’s lives. Ultimately, though, the choice falls to voters themselves. The Tea Party thrived in America partly because a small minority of voters dominate primary races especially for gerrymandered seats. In elections to the European Parliament many voters simply do not bother to take part. That is a gift to the insurgents. If Europeans do not want them to triumph, they need to get out to the polls. Things are looking up in Greece – that’s what Greek ministers have been telling the world of late, pointing to the substantial and rapidly improving primary budget surplus the country is generating. Yet the country’s creditors should beware of Greeks bearing surpluses. A primary budget surplus is a surplus of revenue over expenditure which ignores interest payments due on outstanding debt. Its relevance is that the government can fund the country’s ongoing expenditure without needing to borrow more money; the need for borrowing arises only from the need to pay interest to holders of existing debt. But the Greek government (as we have pointed out in previous posts) has far less incentive to pay, and far more negotiating leverage with, its creditors once it no longer needs to borrow from them to keep the country running. This makes it more likely, rather than less, that Greece will default sometime next year. 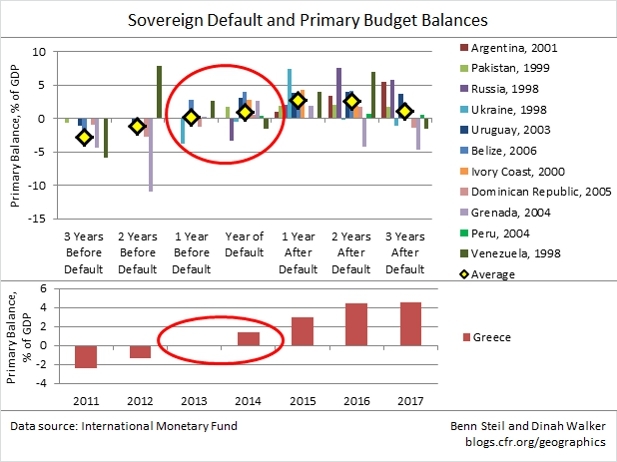 As today’s Geo-Graphic shows, countries that have been in similar positions have done precisely this – defaulted just as their primary balance turned positive. The upshot is that 2014 is shaping up to be a contentious one for Greece and its official-sector lenders, who are now Greece’s primary creditors. If so, yields on other stressed Eurozone country bonds (Portugal, Cyprus, Spain, and Italy) will bear the brunt of the collateral damage. Even after one of the most severe multi-year crises on record in the advanced economies, the received wisdom in policy circles clings to the notion that high-income countries are completely different from their emerging market counterparts. The current phase of the official policy approach is predicated on the assumption that debt sustainability can be achieved through a mix of austerity, forbearance and growth. The claim is that advanced countries do not need to resort to the standard toolkit of emerging markets, including debt restructurings and conversions, higher inflation, capital controls and other forms of financial repression. As we document, this claim is at odds with the historical track record of most advanced economies, where debt restructuring or conversions, financial repression, and a tolerance for higher inflation, or a combination of these were an integral part of the resolution of significant past debt overhangs. Of course, if policymakers are fortunate, economic growth will provide a soft exit, reducing or eliminating the need for painful restructuring, repression, or inflation. But the evidence on debt overhangs is not heartening. Looking just at the public debt overhang, and not taking into account old-age support programs, the picture is not encouraging. Reinhart, Reinhart, and Rogoff (2012) consider 26 episodes in which advanced country debt exceeded 90 percent of GDP, encompassing most or all of the episodes since World War II. (They tabulate the small number of cases in which the debt overhang lasted less than five years, but do not include these in their overhang calculations.) They find that debt overhang episodes averaged 1.2 percent lower growth than individual country averages for non-overhang periods. Moreover, the average duration of the overhang episodes is 23 years. Of course, there are many other factors that determine longer-term GDP growth, including especially the rate of productivity growth. But given that official public debt is only one piece of the larger debt overhang issue, it is clear that governments should be careful in their assumption that growth alone will be able to end the crisis. Instead, today’s advanced country governments may have to look increasingly to the approaches that have long been associated with emerging markets, and that advanced countries themselves once practiced not so long ago. Meanwhile, Germany, which has benefitted economically from the painful Hartz reforms of the early 2000’s may be losing momentum. …First, Germany has the best functioning labor market among large economies in Europe and the United States. Second, German wage restraint is of a relatively limited magnitude compared with most euro area countries and hence fails to explain the uniformly large intra–euro area unit labor cost divergences between Germany and other members after 1999. Third, total German labor costs per worker continue to exceed costs in other major EU countries and the United States. Fourth, Germany’s recent labor market revival has not come about through the expansion of predominantly low wage jobs. Fifth, the expansion of mini-jobs in Germany since 2003 has overwhelmingly taken place as second jobs. And sixth, the successful reliance on kurzarbeit programs in 2009 was not an innovation but rather another instance of labor input adjustment in favor of “insider workers” in Germany. I’m indebted to Quartz.com for the table below which shows German exports and imports by region. Within the Eurozone the two components are fairly balanced but this disguises country specific imbalances, for example, for the first 10 months of 2013, Germany ran a surplus with France of Euro 30bln but a deficit with the Netherlands of Euro 15bln. …That is because Germany’s economy has been living off past glory—especially “Agenda 2010”, a series of reforms launched in 2003 by Gerhard Schröder, Mrs Merkel’s predecessor. But it is running out of puff. Labour productivity has grown less than half as fast as Spain’s over the past ten years; and its overall rate of public and private investment, at 17% of GDP, has fallen by more than a fifth since the euro was introduced. No European country has carried out fewer reforms than Germany since the euro crisis began. … The coalition’s 185-page “treaty” was a chance to launch a new reform agenda. Instead, its proposals are a mixture of the irrelevant—charging foreigners to use German motorways—and the harmful. …The coalition’s pension policy seems even more retrogressive. These days, most advanced economies are expecting longer-living people to be longer-working, too. But the coalition wants the pension age, raised to 67 in the previous grand coalition, to be moved back down again for specific groups, in some cases to 63. France’s president, François Hollande, was rightly mocked, not least by Mrs Merkel, for a similar ploy. Now the woman who has lectured the rest of Europe about the unsustainability of its welfare spending will follow down the same spendthrift road. …The impact on this coalition on the rest of Europe would not be all bad. One bonus is that, for all its primitive economic policies, the SPD seems keener to support some basic reforms such as the creation of a banking union. But that will count for little if Germany, the motor of Europe’s economy, stalls. And, in the light of the coalition agreement, that is a real danger. After a strong performance by European Equities and peripheral government bonds in 2013, the prospects for 2014 may be less sanguine, though I’m not bearish at this stage. The principal market risk is likely to emanate from the European banking sector. One example of this, concerns shipping. 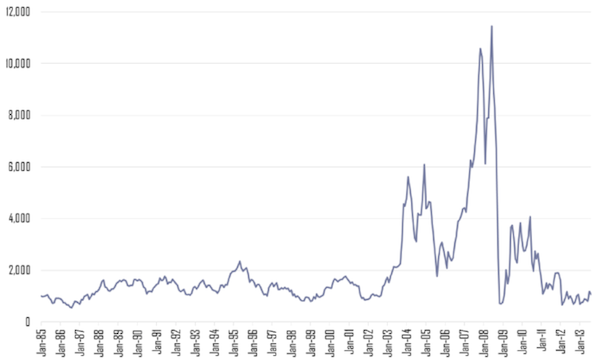 The chart below shows the Baltic Dry Freight Index month end values from 1985 to end December 2013 – it’s worth noting that the BDI has plummeted this month leading many commentators to predict a global economic downturn. 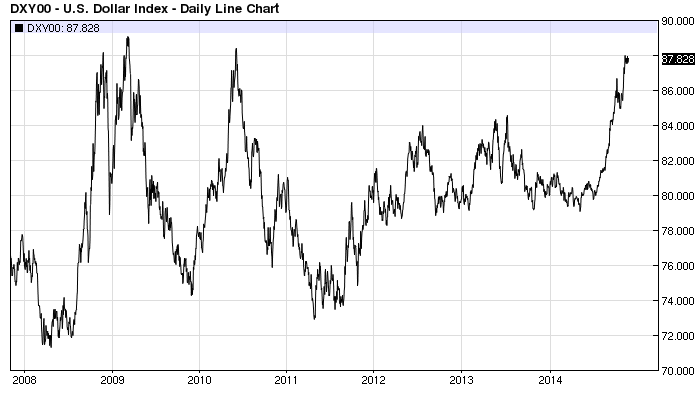 Over the past ten years the price of “Dry” cargoes has soared and plummeted. During this cycle European banks, German ones in particular – abetted by favourable German government tax treatment – moved aggressively into the shipping finance sector; it is estimated that German banks are currently the financiers behind more than 40% of the world container shipping fleet. These shipping loans were often repackaged and sold on to high net worth investors but, rumour has it, the majority of these investments carried a “principal guarantee”. The ships, meanwhile, are no longer competitive due to improvements in fuel efficiency since the mid 2000’s. The banks are effectively left long “scrap metal”. We expect the extended downward shipping cycle to cause rising problem loans in the shipping sector during 2013-14, requiring German banks to increase their loan-loss provisions. This will challenge their earnings power. I wonder whether the ECB’s AQR will uncover the extent of this problem. Last Autumn S&P estimated European banks had a funding gap of Euro 1.3trln as at the end of 2012. My guess is that this is understated: shipping is just one sector, the “quest for yield” is industry wide. Another headwind facing Europe is the weakness in money supply growth. In 2012 EZ M3 was growing at above 3%, it dipped below 3% in H1 2013 and below 2% in H2 2013. 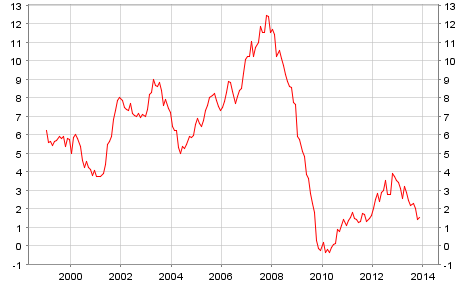 The ECB CPI target of 2% is roughly consistent with M3 growth of 4-6%. J.G. Hülsmann, Deflation & Liberty (2008), p. 27. In economics, interest rates act as gravity behaves in the physical world. At all times, in all markets, in all parts of the world, the tiniest change in rates changes the value of every financial asset. You see that clearly with the fluctuating prices of bonds. But the rule applies as well to farmland, oil reserves, stocks, and every other financial asset. And the effects can be huge on values. If interest rates are, say, 13%, the present value of a dollar that you’re going to receive in the future from an investment is not nearly as high as the present value of a dollar if rates are 4%. So here’s the record on interest rates at key dates in our 34-year span. They moved dramatically up–that was bad for investors–in the first half of that period and dramatically down–a boon for investors–in the second half. Since short term rates are close to zero and central bank buying of government bonds has flattened yield curves in most major markets, surely the risk has to be that government bond yields have an asymmetric upside risk? Well, yes, but only if investors lose all confidence in those “risk-free” government obligations. Added to which – what is the correct size for a central bank balance sheet – $4trln or $400trln? When measured in balance sheet expansion terms the ECB is far behind the curve; they have availed themselves of the aggressive quantitative easing of other central banks to exert internal pressure on profligate EZ countries, cajoling them to structurally reform. I believe this austerity has largely run its course, but, as the AQR, is likely to show, it has left the EZ financial system in a weak position. I still believe European markets represent a “hedged” exposure to the continued bullish trends in major market equities and higher yielding bonds – the market always prefers to travel than to arrive.